What is a Knitting Guild? TKGA is a national non-profit organization with about 100,000 members and local chapters in 25 states and Canada with a focus on education for knitters of all levels. While the word “guild” may bring master craftsmen to mind, you don’t have to be an expert to join here, just have an interest in and love of knitting. Annual Conference: This year’s conference is on July 13-16 in Charleston, South Carolina. There are both classes and a marketplace. Online Classes: You can take mini-courses and classes on specific subjects. Masters Class: Have you ever met a certified Master Knitter? I’ve met just two. 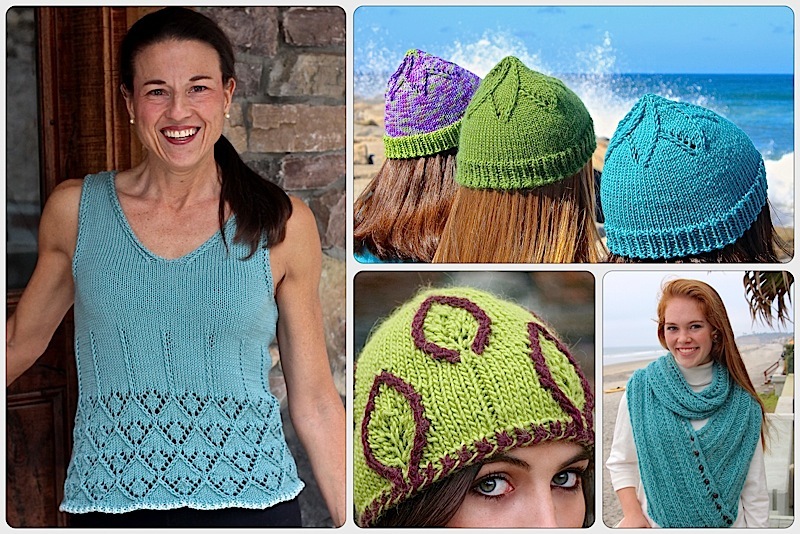 It’s a 3-level endeavor that includes knitting and submitting swatches for judging. I’m dying to try it, I even ordered the information. It will however take more time than I’m willing to commit right now (when I have so much I want to share with you) so I’ll put it off until I can do it right. Haven’t you always wanted to knit during meetings? Well, here’s a meeting where everyone does. My local San Diego North County chapter has 300 members and meets once a month with almost half of the members attending each meeting. It’s an engaged and engaging group. At meetings we have speakers from various aspects of the industry (including Stephen West this month). They organize workshops, charity drives, knitting retreats, stash swaps and a holiday luncheon. It’s a place where you can share your latest finished object and everyone will appreciate it. The chapter also offers Member to Member classes. I’ve taught a few. They help me clarify how to explain new ideas. Plus, there’s just something special about being in a room full of knitters. Now, as much as I wanted to tell you about TKGA there’s a particular reason why I’m doing so now. You see, one of my designs is in the upcoming summer edition. (Yippee, here I am dancing around the kitchen). And while that’s all well and good, and I hope you enjoy the pattern when it comes out, it was the process of writing a pattern for them that started me drafting this blog post. We’ve all read knitting magazine patterns, they are generally written with as few words as possible so as to use as little space as possible. It’s understandable, but not really helpful to the knitter. Not here. Their pattern instructions specifically called for Designer Notes and Technical Tips that will help the knitter understand and learn from the pattern. Nice. These are the kind of things I like to include in my patterns which always have a sidebar full of little tidbits. Breaking the ideas into these two categories has me thinking in a new way and will influence what I include in future patterns. Memberships to TKGA are just $35 annually for individuals and include the four Cast On magazines. There are also membership levels for Designer/Teachers, Retailers and Sponsors. Are you already a TKGA member? If you have a local chapter to tell us about please do so in the comments. It will help other knitters find you. Congratulations Laura. I look forward to seeing your pattern in the next issue. I have been a member of TKGA for a few months now. Am hovering around the idea of Masters Classes but haven’t taken the plunge as yet. Not sure how many other people outside USA and Canada are members, but I suspect there may be a few. This entry was posted on February 29, 2016 by Laura Cunitz in General and tagged Cast On Magazine, Knitting Guild, TKGA.